NEW! This resource contains quality, EDITABLE sample assessment questions and performance tasks for the Life Science Performance Expectation MS-LS1-8. Gather and synthesize information that sensory receptors respond to stimuli by sending messages to the brain for immediate behavior or storage as memories. 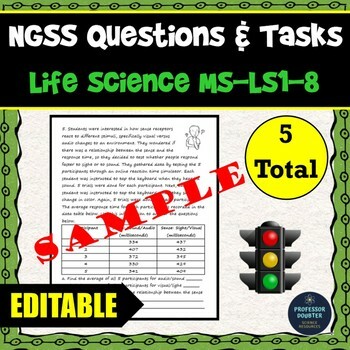 It includes 5 questions or tasks total which can be edited, copied and pasted into various forms of assessments to align to the NGSS. This set of questions require students to use Science and Engineering Practices as well as Crosscutting Concepts to demonstrate understanding of the Disciplinary Core Ideas. The SEPs and CCCs are listed for each PE. Keep in mind that the tasks require more time than a standard test question, therefore, there should be fewer questions on a test which allows for more time to solve the problems. Students were interested in how sense receptors react to different stimuli, specifically visual versus audio changes to an environment. They wondered if there was a relationship between the sense and the response time, so they decided to test whether people respond faster to sight or to sound. They gathered data by testing the 5 participants through an online reaction time simulator. Each student was instructed to tap the keyboard when they heard a sound. 5 trials were done for each participant. Next, each student was instructed to tap the keyboard when they saw a change in color. Again, 5 trials were done for each participant. 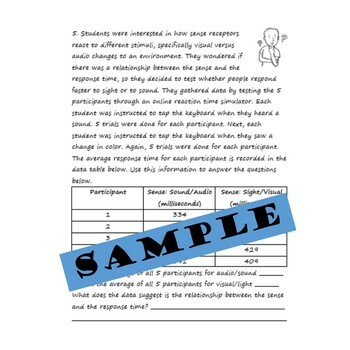 The average response time for each participant is recorded in the data table below (data table provided in document). Use this information to answer the questions below. What does the data suggest is the relationship between the sense and the response time? b. What do you think this means about neurons and/or the pathway of the message? c. Think about why traffic signals might involve lights and not sound as a stimulus. Does the data from this experiment support this use of technology? Explain. Looking for assessments for other Life Science MS-LS1 standards? 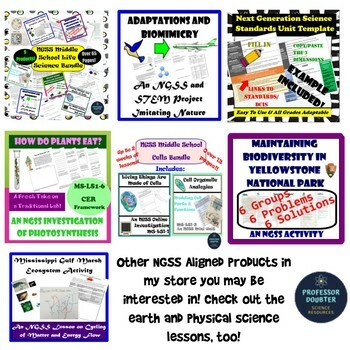 Looking for NGSS lessons, units, activities, etc.? Check out my store for more here: Store Link. 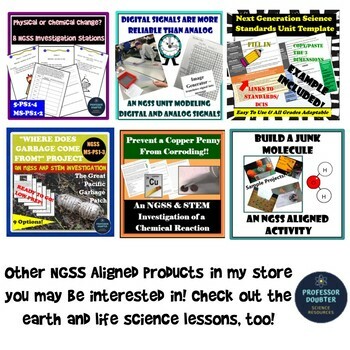 Buy the bundle and have access to all NGSS resources! BE SURE TO FOLLOW ME TO STAY UP-TO-DATE ON MY LATEST RESOURCES!!! Don't forget to rate me to earn TpT credits!